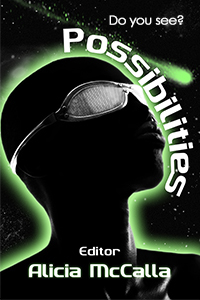 Possibilities Available as a free digital download! State of Black SF authors have created a flash fiction anthology that opens imagination to the idea of what Black speculative fiction can become. These super short stories are morsels of raw potential. Added to the flash fiction anthology are innovative digital artwork. Join artist Winston Blakely and authors Abdul-Qaadir Bakari-Muhammad, LM Davis, Milton Davis, Margaret Fieland, Edward Austin Hall, Valjeanne Jeffers, Alan Jones, Alicia McCalla, DjaDja Medjay, Balogun Ojetade, Alexis Pauline, Rasheedah Phillips, Wendy Raven McNair, and Nicole Sconiers as they endeavor to explore the possibilities of Black SF in the broad ranges of Science Fiction from Paranormal to Steampunk. Readers will see the possibilities of Black SF. Available on Amazon for .99 cents and .77 on Amazon UK. Check out this thorough FutureFire Review!